Left-leaning political commentator says he will throw his weight behind the movement. 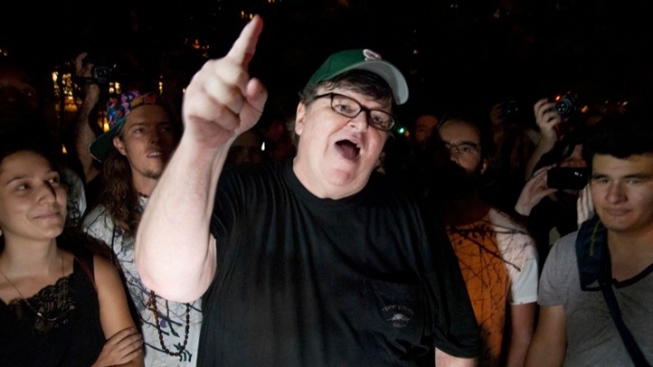 Filmmaker Michael Moore visits the "Occupy Wall Street" protest in Zuccotti Park. He plans to visit "Occupy Oakland" Friday. While Mayor Jean Quan was getting booed back into city hall, Michael Moore was planning a trip to the revamped Occupy Oakland. The notorious political commentator was scheduled to appear at book signing in Oakland on Friday, and Thursday he wrote on his blog that he plans to visit Occupy Oakland at Frank Ogawa Plaza before his signing. Occupy Oakland has taken center stage of the national occupy movement after Quan and city officials decided to crackdown on the protesters' encampment in front of city hall earlier this week. When the response turned violent, and a former Iraq war veteran was caught on YouTube with a serious injury, Occupy Oakland found itself being talked about by the likes of Keith Olbermman, Fox News and The Drudge Report. Moore was one of those people who took notice, putting up links to articles about the closure of Occupy Oakland and going on "Countdown" with Olbermann to talk about the crackdown. Reports suggest that Moore will make an appearance around 3:30 p.m. and he is scheduled to appear at a PCA Bookstore Meeting in Oakland at 5:15 p.m.
Moore will not be the first celebrity to visit Occupy Oakland. Rapper Lupe Fiasco stopped by when he was performing in Oakland last week and promised to provide the protesters with anything that they needed.